He is host of public television’s Folkways, a North Carolina program that takes the viewer through the Southern Mountains visiting traditional craftsmen and musicians. David also currently hosts the PBS series Great Scenic Railway Journeys. He served as host of The Nashville Network’s Fire on the Mountain, Celebration Express and American Music Shop. He has been a frequent guest on Hee Haw, Nashville Now and The Grand Ole Opry. 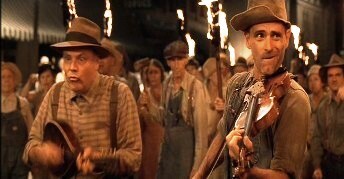 David can also be seen as a musician in the popular film, O Brother Where Art Thou. David hosts Riverwalk: Classic Jazz From The Landing for Public Radio International. Riverwalk, in its thirteenth year, is broadcast nationally from San Antonio, Texas, and combines stories of the jazz greats told by Holt with the traditional jazz music of the Jim Cullum Jazz Band and guests including Lionel Hampton and Benny Carter. In 2002, Doc Watson and David won two Grammy Awards for Best Traditional Folk Recording for Legacy, a three CD collection of songs and stories reflecting Doc Watson’s inspiring life story. Live and Kickin’ at the National Storytelling Festival received a Grammy nomination. An entertaining look at David’s musical and storytelling journey of the last forty years. David takes the audience from his beginnings as a Texas bones player to a rock and roll drummer in the 60′s to a nationally acclaimed Southern Appalachian musician. Accompanied by his son, Zeb, David entertains with humor, music and true-life stories. I Got A Bullfrog: Folksongs For The Fun Of It features great American folk songs David has collected over the last twenty years and has garnered many awards. Grandfather’s Greatest Hits received a 1992 Grammy Award nomination for “Best Traditional Folk Recording.” It is a collection of the great folk songs of early country music. Featured on the album are the legendary Chet Atkins, Doc Watson and Duane Eddy playing together for the first time. Spiders in the Hairdo: Modern Urban Legends was nominated for a Grammy Award for 1999 in the Adult Spoken Word Category. Why the Dog Chases The Cat: Great Animal Stories with co-teller Bill Mooney, was nominated for a 1995 Grammy Award. Ready-To-Tell Tales From Around the World edited by David Holt and Bill Mooney. The books bring together tell-able stories from the nation’s best professional storytellers. The Storyteller’s Guide by Holt and Mooney (August House 1996) is a complete “how-to” for storytellers. Spiders in the Hairdo: Modern Urban Legends is a collection of the funniest, scariest, downright weirdest tales going around today. Read about stupid criminals, scams and conspiracy theories, students clever enough to outsmart the professor though not smart enough to pass the test, and jerks who get their just desserts. Collected and retold by David Holt and Bill Mooney and based on their Grammy nominated audio tape. Fifty five stories that will make your hair stand on end…possibly into the shape of a beehive hairdo. The Exploding Toilet: Modern Urban Legends collected and retold by David Holt and Bill Mooney. A follow-up to Spiders in the Hairdo with a whole new collection too good to keep to yourself.